By submitting to Skylark you provide your email address and we will assume you wish to be contacted, not only about the status of your submission, but also regarding publications of titles and calls for submissions. Your name and email address will be used solely for this purpose. If you no longer wish to submit and wish to be removed from our email list, please contact us. You can also use the form below if you would like to hear from us in the future, whether you are a poet submitting work, or not. keep in touch . . .
Skylark 12 winter 2018 (6:2) now available! Please click on the 'store' tab for full details. The eleventh issue of Skylark is published! Please click on the 'store' tab for full details. DEADLINE EXTENDED TO JUNE 30th 2018! We have already received some fine submissions but believe we can find more range to give this project the greatest impact. if you have already submitted but have not exceeded the number of individual pieces permitted (see below) please send in more work. My schedule is such that I sometimes take a while to respond. Please be assured of my commitment and dedication to all Skylark projects. Thank you for your patience! A second anthology of tanka from Skylark Publishing. Call for Submissions. Please share widely. We spend much of our lives trying to find the perfect state of mind and that is no easy task. Children seem to instinctively inhabit that heavenly world that is at one and the same time mindful and mindless; they reside wholly in the now. As we mature, being mindful seems to take on a new meaning: we must take care, make note, be aware, alert, vigilant. And to be mindless suggests a lack of attention, selfishness and diminished feeling. In an age when more and more children are suffering from anxiety and depression, it seems that we are becoming servants rather than masters of our own minds. Many people believe that the smartphone, the world wide web and the have-it-all, have-it-now mentality of society as a whole have a lot to do with the younger generation’s lack of peace of mind. Similarly, and inexplicably, the number of children and adolescents who will be diagnosed with Autism Spectrum Disorder is predicted to climb in the next few decades. With increased awareness, we can only hope that there will be fewer adults 'falling through the net', struggling to live in an unsettling world that has failed to recognise their uniqueness and understand it for what it is. However, we must not forget ‘the happy place’ in which we all lodge from time to time, doing what we love, in the company of those we love -- or blissfully alone! -- and the simple pleasure of being. Nor can we dismiss the sheer brilliance of the human mind and how often we are left spellbound by its creativity; as poets we often find ourselves in the thrall of a Muse who can be a demanding, yet fickle, mistress. Poets are invited to submit up to 25 tanka/tanka sequences/tanka prose inspired by the title: its own place: a mindscape of tanka. (For example, you might choose to send 20 individual tanka and 5 sequences, or 18 individual tanka, 5 sequences and 2 pieces of tanka prose). Please do not send collaborative sequences, rengay, tanka art or tan renga, as these will not be considered. You are free to interpret the theme in any way you wish: you might consider topics such as anxiety, depression, post and prenatal depression; PTSD, psychosis, bipolar, schizophrenia; autism, Aspergers, learning disability; mid-life crisis, the ‘Crone’, menopausal depression, premenstrual syndrome; creativity, the Muse, dreaming, mindfulness, meditation . . . the list goes on. May the mind wander where it will . . .
Submissions will open on December 15th 2017 and will close on April 15th, 2018. DEADLINE EXTENDED TO JUNE 30th 2018. Submissions to Skylark are also open through December and January, so please bear in mind that you may not be notified of acceptances for 6-8 weeks. However, please do not let this deter you from submitting early in the period as all work will be considered from the outset and competition is likely to be high. For this anthology previously published high quality poetry WILL be considered, although preference will be given to new work. Please provide full citation details of previously published works. Poems that have appeared on social media platforms, personal blogs, or in private groups/workshops will be considered, although you must indicate this is the case and the poem to which it applies. Please send your submissions to inkstonemoon@gmail.com with the subject heading: its own place/your name. You will receive an automated response, acknowledging receipt of your submission. If you don’t, feel free to inquire. 25% of any profits from the Anthology will be donated to a related charity/charities. 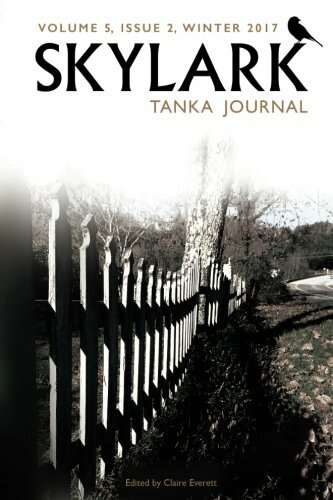 The tenth issue of Skylark is published! Please click on the 'store' tab for full details. The friendship of Australian tanka poets Beverley George and David Terelinck has produced many gifts over the decade of their collaboration. The present volume draws together under a single umbrella all of their responsive writings to date: 23 ‘journeys,’ including five previously unpublished pieces. Here are ten collaborative tanka sequences of 5 to 14 tanka each, including one sequence, ‘Converging Worlds,’ in which each individual tanka is a joint composition. The collection also includes 13 rengay, each composed of six two- or three-line haiku-like verses, which, in combination, suggest five-line tanka. The poets seem to have explored every possible way of joining their two voices. Each of us must dream alone, yes—but thoughts tangle and voices echo; worlds converge and something new emerges, something larger than our private dreams. that’s beginning to cool . . .
A poignant sense of loss and regret is expressed in the second verse, but the act of writing seeks to capture and cherish ‘those memories’ rather than sell them cheap. Among these pages, memories are held dear, a stay against the swiftness of time. As our fragile days slip past, dreams persist, and so do abiding love and friendship, which anchor and guide us as we navigate our lives. Through their many-faceted explorations of human intimacy in all its forms, David Terelinck and Beverley George celebrate the mysterious alchemy of friendship and the joys of travelling under a shared umbrella. Earth: Our Common Ground published! April 2017, just ahead of Earth Day on the 22nd, Skylark's first anthology Earth: Our Common Ground is now available. Earth: Our Common Ground has its roots in the momentous decision made by North Yorkshire County Councillors in May 2016 to approve a bid by Third Energy to extract shale gas at a site near Kirby Misperton in Ryedale, an area in the timeless North Yorkshire Moors . . .
Public outcry is a way of life these days; a domino-rally that cascades across the globe. In our millions, we are speaking out in defense of Earth, desperate to defend her against The Man . . . Featuring the work of over 100 poets, this Song of Short Songs "is a skein of love, longing and loss, pleasure and pain, despair and wonder -- for all of earth-kind, be they termite beings, jaguar beings, rock beings, tree beings, or human beings . . ." (Adapted from the Foreword by Claire Everett). *25% of any profits will be donated to frackfreeryedale.org as we continue to fight fracking here in the UK. Available for purchase. Click on the links above for details. ​ Cover illustration ​© joanne rose, used with permission. Call for Submissions: Please share widely. Never has it felt more appropriate to announce this submission call for tanka on the subject of ‘Earth: Our Common Ground’ for an anthology slated for publication towards the end of 2016. In the light of the Planning Committee of North Yorkshire County Council voting yes to Third Energy’s proposal to begin fracking in Kirby Misperton in North Yorkshire, it has brought home to me even more how tenuous our foothold is on this beautiful planet that asks nothing of us even as we make constant demands of its energy and resources. And when the time comes, and enough is enough, Earth will go on without us. It has been often said, we don’t merely inherit the earth from our ancestors, we borrow it from our descendants. Never before has it been so vital that we honour and respect the legacy we have been granted and the one we will leave for generations to come. No matter our differences and the things that divide us, be they ethnicity, culture, politics, religion, wealth, gender, sexuality . . . we have one thing in common: Earth. Poets are invited to submit up to 25 tanka/tanka sequences/tanka prose inspired by the title. (For example, you might choose to send 20 individual tanka and 5 sequences, or 18 individual tanka, 5 sequences and 2 pieces of tanka prose). Please do not send collaborative sequences, rengay, tanka art or tan renga, as these will not be considered. You are free to interpret the theme in any way you wish: you might consider topics such as earth spirituality; earth gods and goddesses; ancient sites and cultures; tanka of place; Gaia Theory; natural disaster; environmental concerns, protests and activism; inter-being and interconnectedness . . . the list goes on. Poets are encouraged to share their passions, to celebrate, commemorate and honour the existence of this, our common ground, from the smallest creature, backyard haven, or beloved vista, to the ultimate panorama: Earth’s special place in the universe as a pale blue dot in space. Submissions will open on June 1st and will close on September 30th, 2016. Submissions to Skylark are also open through June and July, so please bear in mind that you may not be notified of acceptances for 6-8 weeks. However, please do not let this deter you from submitting early in the period as all work will be considered from the outset and competition is likely to be high. Please send your submissions to inkstonemoon@gmail.com with the subject heading Earth: Our Common Ground/your name. You will receive an automated response, acknowledging receipt of your submission. If you don’t, feel free to inquire. Please do not send previously published tanka, however poems that have appeared on social media platforms, personal blogs, or in private groups/workshops will be considered, although you must indicate this is the case and which poems it applies to. Earth: Our Common Ground will be published by Skylark Publishing and will be available to purchase from Amazon and Createspace. 25% of any profits will be donated to frackfreeryedale.org as we continue to fight fracking here in the UK. Thank you! I look forward to reading your work. Why Skylark? This small brown bird is often hailed as the very voice of spring. It lives on open farmland, or heath, and spends much of its life foraging. In the spring, male birds compete for mates by singing almost non-stop, ascending on hovering wings to heights of 100 metres as they do so. Throughout their long, liquid songs, they appear to not take a breath. Their very breath is song, a form of circular breathing whereby the air passes through the lungs and nine separate cavities, and even the birds’ hollow bones. At times, it seems that the sky itself is spilling song, for the songster himself is fluttering too high to be seen. If a flock of birds is seen, it is described as an “exaltation”! It is no surprise that the bird has inspired poets through the ages:Percy Bysshe Shelley, William Wordsworth, George Meredith and Ted Hughes to name but a few. Skylark, an English-Language tanka journal dedicated to tanka in all its forms, hails from North Yorkshire, England. The inaugural issue appeared in summer 2013 and the journal continues to go from strength to strength under the editorship of its founder, Claire Everett. In 2014, Jenny Ward Angyal joined the team as Reviews and Features Editor. Amy Claire Rose Smith is the Skylark artist. Skylark welcomes submissions from international poets, new and established alike. Please refer to the submissions page for details. and read about them here. This is the first edition of what promises to become a leading international tanka journal, and is the only print journal of its type in the UK. It oozes class and I have already read it several times. Can't wait for the next edition. The Journal had a beautiful layout. Wonderful writing. I enjoyed reading it. It was a lot larger than I expected. 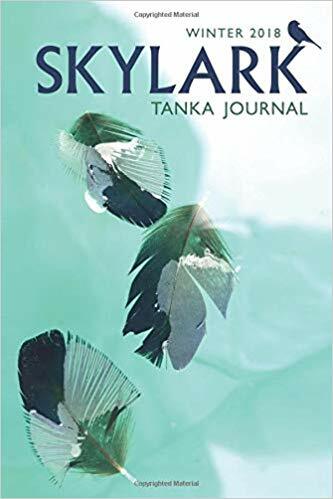 Skylark is a lovely tanka journal, full of beauty and cohesion. I'd highly recommend it to any lovers of the Japanese form but also to anyone who likes poetry of any kind. Skylark is a must have for contemporary tanka poetry writers and readers. It includes a treasure trove of variety of subject and is helmed by a skillful and talented writer herself. Skylark is a bi-yearly publication and is a beautiful addition to any Japanese short form poetry library, containing a great selection of what's being done in the field today. 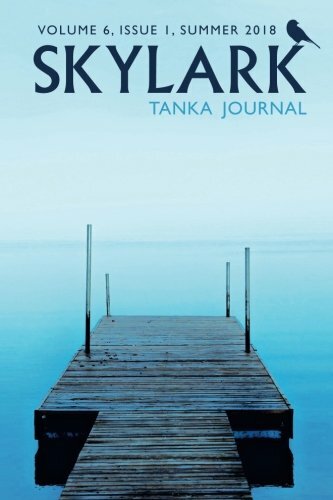 Skylark is a very well edited journal with excellent production values at a reasonable cost. Highly recommended for all with an interest in Japanese style poetry! A beautiful collection of contemporary tanka by many talented authors. A delight to read.